We’d love your help. 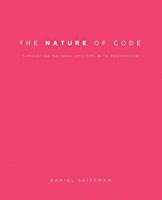 Let us know what’s wrong with this preview of The Nature of Code by Daniel Shiffman. To ask other readers questions about The Nature of Code, please sign up. I think this book is the best choice if you're starting in the world of Computational Science and simulation. But not only! If you know how to simulate or programming, but you want to learn how to start programming some complex systems (like neural networks, for example) this book is great. Or even if you're planning to become a videogame programmer, this book also is a good choise! The language is very simple and is really easy to read and follow. It starts from zero, you don't need to know almo I think this book is the best choice if you're starting in the world of Computational Science and simulation. This book took me the longest to read. I read it in parts and not in any order. I have this book to thank for my interests in the link between biology and computers. So many things have been inspired by or are connected to nature in computer science: neural networks, genetic algorithms and fractals to name a few. It has also been an inspiration for many of my projects. The amount of fascinating information explained in such simple ways is amazing. How complicated subjects are made visual in variou This book took me the longest to read. I read it in parts and not in any order. It has also been an inspiration for many of my projects. The amount of fascinating information explained in such simple ways is amazing. How complicated subjects are made visual in various ways. The best thing about this book is its simplicity and elegance in describing the patterns we find in nature through code. It's great for learning programming, physics, math or art. Or, even better, all of the above! Gentle introduction to OOP using Processing, showcasing its tremendous power. 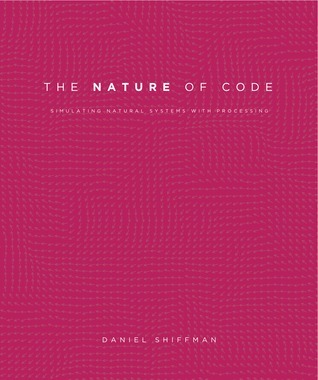 The Nature Of Code, by Daniel Shiffman, is a wonderfully written book, which is not only useful for learning how to code certain simulations, but also to learn how to analyze a phenomenon and recreate it in smaller scale through code. Even though it may seem like this is more of an advanced book, in reality it requires almost no programming knowledge to read, and can be picked up by anyone. Shiffman's writing style is fluid and the low register used throughout the piece really helps with grasping The Nature Of Code, by Daniel Shiffman, is a wonderfully written book, which is not only useful for learning how to code certain simulations, but also to learn how to analyze a phenomenon and recreate it in smaller scale through code. I've decided to put some of the geeky maths books I read up on here, at least the good ones, and this one is good! You can make things fly about the screen! And give those things basic intelligence and all sorts! Its written for processing, but its more of a conceptal book than a processing one. Once you get those concepts, you can apply it anywhere. If you want to do AI, Steering Behaviours, Motion Graphics, even XSI ICE and Houdini effects, this book will really help you(even though its not abou I've decided to put some of the geeky maths books I read up on here, at least the good ones, and this one is good! Its written for processing, but its more of a conceptal book than a processing one. Once you get those concepts, you can apply it anywhere. If you want to do AI, Steering Behaviours, Motion Graphics, even XSI ICE and Houdini effects, this book will really help you(even though its not about those programs). Its also great for Computer game programming - its really easy to convert the code to Unity for example. Go Go Go Go Coding skills! This book is a nice and light introduction to artificial intelligence, from the perspective of producing nice visualisations. If you are more interested in the AI parts than the visualisation with the Processing platform, you may want to check out other books. This book in it self is art, it taught me a lot about coding from simple physics engines to neural networks. It didn't go into much details into its subjects but it was really fun to read and try out the code and mess around with it. If you're into Artificial Life, this is a must have. Great book. It summarizes the concepts of nature, movement and physic laws from our world to code in a very explanatory and intuitive way. It's a must have book to understand how to program in real world, so it's good for math, physics, games and experimentations. La parte relativa agli algoritmi genetici e agli automi cellulari è meravigliosa, non posso che consigliare la lettura di questo libro a chi si interessa veramente al mondo della programmazione. amazing book on sw development. goes deep with many interesting topics and aspects covered through-out. if you want to re-discover all. this is a fascinating book. A book for people with little programming knowledge, while still being worthwhile for those with experience.